In The New Guitarscape, Kevin Dawe argues for a re-assessment of guitar studies in the light of more recent musical, social, cultural and technological developments that have taken place around the instrument. 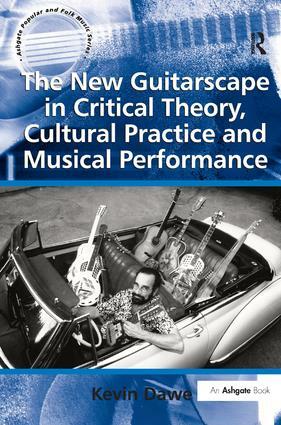 The author considers that a detailed study of the guitar in both contemporary and cross-cultural perspectives is now absolutely essential and that such a study must also include discussion of a wide range of theoretical issues, literature, musical cultures and technologies as they come to bear upon the instrument. Dawe presents a synthesis of previous work on the guitar, but also expands the terms by which the guitar might be studied. Moreover, in order to understand the properties and potential of the guitar as an agent of music, culture and society, the author draws from studies in science and technology, design theory, material culture, cognition, sensual culture, gender and sexuality, power and agency, ethnography (real and virtual) and globalization. Dawe presents the guitar as an instrument of scientific investigation and part of the technology of globalization, created and disseminated through corporate culture and cottage industry, held close to the body but taken away from the body in cyberspace, and involved in an enormous variety of cultural interactions and political exchanges in many different contexts around the world. In an effort to understand the significance and meaning of the guitar in the lives of those who may be seen to be closest to it, as well as providing a critically-informed discussion of various approaches to guitar performance, technologies and techniques, the book includes discussion of the work of a wide range of guitarists, including Robert Fripp, Kamala Shankar, Newton Faulkner, Lionel Loueke, Sharon Isbin, Steve Vai, Bob Brozman, Kaki King, Fred Frith, John 5, Jennifer Batten, Guthrie Govan, Dominic Frasca, I Wayan Balawan, Vicki Genfan and Hasan Cihat Ã–rter. Contents: Foreword; Preface; 10 musical lives of the guitar; Taking stock of the guitar phenomenon; The new guitarscape and musical instrument studies; Notes on guitarscaping; Materiality and the virtual guitar; The sensual culture of the guitar; Gender and sexuality in the new guitarscape; The power and agency of the guitar; Guitars, travel and translation; Concluding remarks; Bibliography; Index. Kevin Dawe is Professor of Ethnomusicology and Head of the School of Music and Fine Art at the University of Kent, UK. Popular musicology embraces the field of musicological study that engages with popular forms of music, especially music associated with commerce, entertainment and leisure activities. The Ashgate Popular and Folk Music Series aims to present the best research in this field. Authors are concerned with criticism and analysis of the music itself, as well as locating musical practices, values and meanings in cultural context. The focus of the series is on popular music of the twentieth and twenty-first centuries, with a remit to encompass the entirety of the world’s popular music. Critical and analytical tools employed in the study of popular music are being continually developed and refined in the twenty-first century. Perspectives on the transcultural and intercultural uses of popular music have enriched understanding of social context, reception and subject position. Popular genres as distinct as reggae, township, bhangra, and flamenco are features of a shrinking, transnational world. The series recognizes and addresses the emergence of mixed genres and new global fusions, and utilizes a wide range of theoretical models drawn from anthropology, sociology, psychoanalysis, media studies, semiotics, postcolonial studies, feminism, gender studies and queer studies.